The latest research report by Zion Market Research (ZMR) states that the global social media analytics market is representing an enormously aggressive business environment with the charisma of a number of dominant players. Oracle Corporation, Salesforce, Adobe Systems Incorporated, SAS Institute Inc., GoodData Corporation, International Business Machines Corporation, Netbase Solutions Inc., Unmetric Inc., Simplify360 Inc., Cision US Inc., Meltwater, Hootsuite Media Inc., Brandwatch, Germinait Solutions Private Limited, Digimind, Clarabridge Inc., Sysomos, Crimson Hexagon Inc., Socialbakers, Simply Measured Inc., Sprinkler Inc., Spredfast Inc., Synthesio, Lithium Technologies Inc., and Tableau Software Inc. are few of the dominating players in the global social media analytics market. The important driving factors for the global social media analytics market are the rising usage of social media such as facebook, youtube, Twitter, and Linkedin. These social media platforms have encouraged enterprises for the adoption of social media analytics solutions in their businesses. In addition, increased competition and rising deployment of business intelligence are projected to propel the global social media analytics market. Increasing requirement for the product branding of companies and their superior capabilities to respond to the customer requirements are assisting in fueling the global social media analytics market. Increased trend of cloud adoption and increased structured & unstructured data in SME on the global level is supposed to enhance the revenue of the global social media analytics market in the upcoming period. 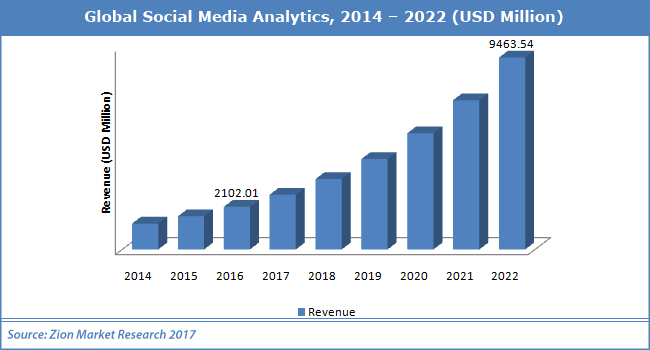 The global social media analytics market is segmented on the basis of numerous factors such as component, deployment, application, type, region, and end users. The deployment segment in the global social media analytics market is divided into on-premises and cloud. The component segment from the global social media analytics market includes software and service. The service from the global social media analytics market is further sub-segmented into professional service and managed service. The software segment from the global social media analytics market is projected to hold the maximum market share owing to the rising demand for the social media analytics software in organizations. The latest software assists firms for collection and analysis of data. The Type segment from the global social media analytics market involves prescriptive analytics, predictive analytics, descriptive analytics, and diagnostic analytics. The global social media analytics market for the predictive analytics tools is estimated to show growth with the maximum rate in the upcoming period. The application segment from the global social media analytics market includes customer experience management, sales & marketing management, risk management & fraud detection, competitive intelligence, public safety & law enforcement, and others. Sales and marketing management segment in the global social media analytics market held the largest market share in 2016. It is estimated to lead the global social media analytics market in the future as it is involved in assisting organizations for improving their businesses solutions.